Welcome to What Kids Wore Wednesday- the link party for kid, toddler and baby style! There are plenty of parties for mom's to share their own style, but not enough for kids! This is the place to link up your cute kids and share their style. What did my kids wear? We are mostly in jammies and comfy clothes over here right now- even my older ones have been stuck in their jammies all day lately. Oops. Although I love to get out and do things, it has been nice to be forced to just slow down and live low key for a while. Knox has been a great baby and the boys are so far adjusting very well. Our feature for the week is from Mend and Make New. Can you believe how lucky little Isabelle is? 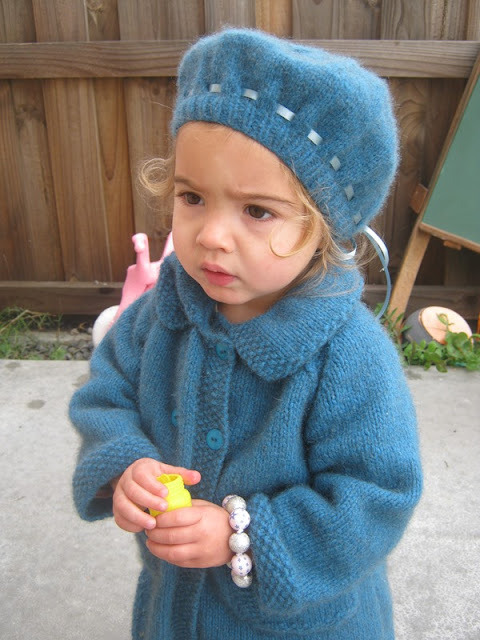 Her Nana knitted this darling hat and coat for her! It looks so soft and will be perfect for this fall and winter! Thanks for linking up! He is darling! Hope your'e feeling better!